I'll fussy-cut the birds, and surround them with different solids. The bird fabric isn't a bright white, but instead more of a warm-toned white, so I grabbed a warm white to use for white space. 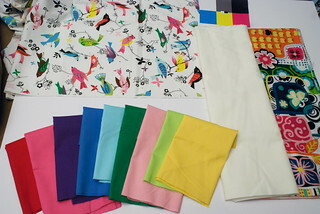 The bright, busy fabric on the right is the quilt backing.